If you are looking for a template for a strategic plan, you have come to the right place! A strategic plan template will not only save you hours of work but it will also provide you with guidance and direction on the features that a good strategic plan should encompass. Using a template will ensure that your strategic plan has a professional finish and creates an impression that the job has been done well. 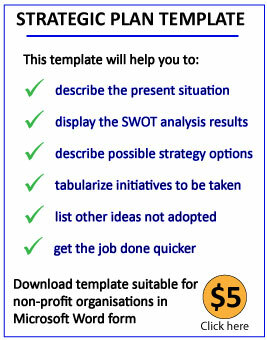 The template has been developed as a result of researching strategic plans from many organisations, large and small. Although, in its present form it suits a sport club with outdoor facilities, it can be easily adapted to suit any organisation. These sections can be replaced or deleted as required. Please click here if you wish to obtain a version of this template in Microsoft Word.